The Mayan writing system was in use from the 3rd century BC to the 16th-17th century AD (and related languages are still spoken today, which I believe was one of the aids in the writing system’s decipherment). Although it is often referred to, especially by non-experts, as a sort of ‘hieroglyphic’ script, I think applying labels like this can be somewhat misleading so we will instead try to think at a very basic level about what sort of writing it constitutes. I will add a disclaimer here that I am not in any way an expert on Mayan, but I would nevertheless like to share a few thoughts on the system as I understand it from my limited experience. At the seminar, I was first alerted to the fact that Mayan was going to be very different from my previous experiences of ancient writing systems when Professor Houston began using phrases like ‘stepped decoding’ and ‘slow reading’ to describe the reading process and ‘intrinsically efficacious’ to describe the script. It is important to begin with an appreciation that the Mayan writing and reading experience is very different to what we are used to when we write or read today. Figure 2. Three different ways of writing AJAW ‘lord’. For one thing, Mayan glyphs display a great deal more variation in shape than one would expect in most writing systems. Many glyphs are (more or less obviously to the non-expert eye) pictures of things, animals and people, and can be represented in different ways and doing different things. Glyphs can interact with each other, and they can be limited e.g. to a face, or they can include the person/animal’s whole body. These types of variation make the writing process appear both complex and rather playful, and imply that the reading experience involved more than a simple sign-decoding process: a certain amount of interaction with and interpretation of pictorial elements is required. Even very pictorial sorts of writing system from the Mediterranean, like the Egyptian hieroglyphic one, tended to have much more limited variation in sign shapes. At a basic level, if a writer has freedom to be so creative in the way a sign is depicted, then the reader has to be prepared to put in considerable effort to read the message. However, while the degree of variation is almost alarming to someone like me who deals with more standardised writing systems most of the time, there are some reassuringly systematic features that I found it easier to relate to. Firstly, there is a standard way of reading columns of glyphs, which tended to involve reading two glyphs in a dextroverse direction (left to right), then moving down to the next row and doing the same until you get to the bottom, after which you start at the top of the next double column. Figure 3 illustrates this more effectively (though in this case the top of the first double column contains a single wider glyph). Figure 3. Order of reading of the beginning of a stele from Yaxchilan. We can describe the Mayan script as a logosyllabic system, with some signs standing for whole words (logograms) and some for syllables (syllabograms), which can also be combined with each other. This already begins to make the system feel more familiar to me, and at least comparable with others I have studied in the past, such as various forms of cuneiform in which Akkadograms and Sumerograms have a logographic function alongside the more common syllabographic signs – although the abstract wedge-shaped nature of cuneiform signs is a far cry from the pictorial Mayan ones, and Mayan allows far more flexibility in the different ways in which signs can be combined. Figure 4 shows three different ways of combining the signs CHUM, TUN and ni to make a phrase meaning ‘stone seating’ (chum tuun). Figure 4. Three different ways of combining signs CHUM, TUN and ni. So even though these look much more like pictures than writing to the modern eye (which is no coincidence considering the degree of creativity and variation that is intrinsic to the script), there is no question that Mayan writing is systematic, and it is the presence of the system that allows both the writing and decoding processes: this is an idea I am working on in an entirely different context, and so this makes an interesting comparison. I will finish with something that even an untrained eye might be able to recognise. Have a look at Figure 5 – what do you think the straight lines and little circles represent? If you guessed that these might represent numbers, you would be right! I was unduly pleased with myself when in Professor Houston’s seminar I worked out that the straight lines must be ‘5’ and the circles must be ‘1’ on my own (using some provided contextual information) – which just shows you that there is an entry level for even a very strange-looking script like Mayan. That’s it for today. 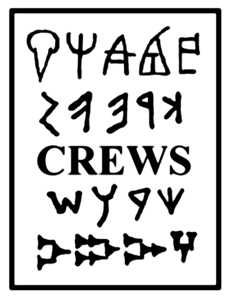 I hope you enjoyed this all-too-brief excursus on Mayan, and soon we will return to looking at the different writing systems that make up the CREWS logo.